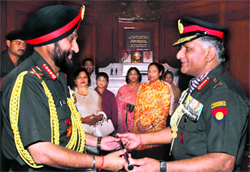 General Bikram Singh today took over as the 27th chief of the 1.13-million strong Indian Army, bringing to an end the controversial 26-month tenure of his predecessor General VK Singh, who retired after 42 years of service. The Union Cabinet on Thursday approved a new telecom policy that aims to ultimately abolish roaming charges, allow users to retain their numbers even if they move from one zone to another, besides boosting transparency and growth in the scandal-hit sector. Five persons were killed and 35 others injured when seven coaches of Howrah-Dehradun Doon Express derailed near Jaunpur, around 250 km from here on Thursday. "Five persons have been killed and nearly 35 injured," said Jaunpur SP, Akash Kulhari said. The all-India bandh called by the NDA and the Left today in protest against the petrol price hike evoked a mixed response amid stray incidents of violence in Maharashtra, Karnataka and West Bengal and blockade of road and rail traffic. The blistering heat wave continued to sweep Punjab, Haryana and Chandigarh with mercury hovering between 41 and 46�C at many places. In fact, the northern and eastern parts of the country baked at above normal temperatures today due to the scorching summer sun and hot winds.